Four new moulded angled IEC Lock models have been introduced as a direct result of numerous customer requests for a smaller, more versatile version of the existing C13 IEC Lock+ that can fit into tighter spaces. The new range comprises a left angled C13 IEC Lock+, right angled C13 IEC Lock+, up angled C13 IEC Lock+ and down angled C13 IEC Lock+. They come with a two part handle located at the front of the connector to minimise the overall length of the connector, with the added benefit that the handle can be removed where space is limited. 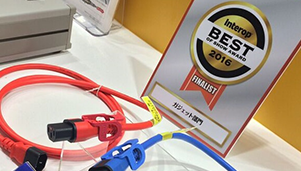 All four connector types share the same interface and locking mechanism components. 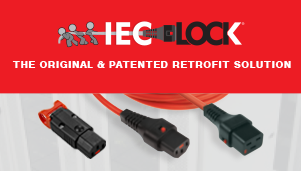 Two new angled re-wireable C13 IEC Lock+ Connectors – a right angle connector and a down angle connector – have been added, again as a result of increasing customer demand for a smaller version of the existing rewireable C13 IEC Lock+. They come with a two part handle located at the front of the connector to minimise the overall length of the connector and both share the same interface and locking mechanism components. The outer housings can be mounted in either orientation, which means the right angle connector can be converted to left angle and the down angle connector can be converted to up angle. The range is being supported with a new website www.ieclock.com, which showcases the new, modernised logo. A newly designed product display stand and a promotional video have also been produced to help promote the range.